I am writing to thank you for allowing our family to adopted a dog. 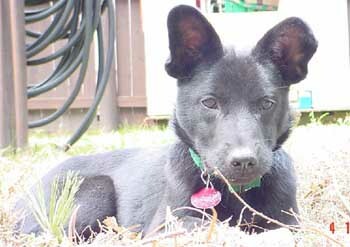 Two months ago we adopted Cinder ( now named Shadow ), a little black puppy about 4 1\2 months old, black lab mix. I have to tell you what a love this dog is, and how he brings joy to our lives. A little more than a year ago our dog Reggie passed away suddenly, I raised Reggie from a little 6 week old puppy to a 110 lb. 10 year old golden lab mix. He was my best friend and when he died I never thought I could ever find a dog to fill the hole he left.